Ryland Peters & Small, 9781849759670, 160pp. What better way to celebrate summer than to enjoy the very best food cooked over the fire whether at the beach, camping, or in your own back yard. 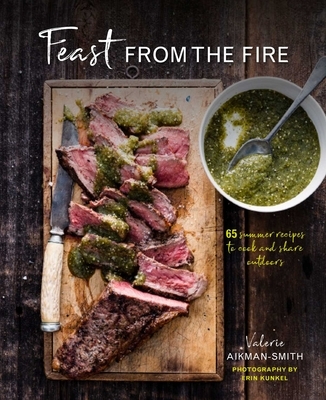 Combining fresh flavors with exciting grilling techniques including cooking on a fire pit grill, salt block cooking, and cedar-plank smoking, Valerie Aikman-Smith presents 65 recipes for relaxed summer entertaining. The first chapter features delicious seafood recipes including Baja Fish Tacos with Blistered Jalapeños, Grilled Snapper in Banana Leaves, and Mezcal Lime Shrimp. For meat-lovers there’s a host of ideas for grilling your favorite fare such as Jerk Pork with Mango Chutney and Grilled Honey Plantains, Portuguese Piri Piri Poussin, and an All-American Burger. Valerie includes fabulous vegetable dishes from Grilled Zucchini Flowers with Shiso Lemon Salt to Roasted Cauliflower with Walnut Romesco. Sweet Things designed to round off an alfresco feast include Matcha Ice Cream with Black Sesame Praline or a classic Grilled Banana Split with Dark Chocolate Sauce. Finally, if all the heat has made you thirsty, try a Basil Aperol Spritz with Flowering Herbs, Sicilian Slush Cocktail, or a Watermelon Margarita. Valerie Aikman-Smith is a Los Angeles-based food stylist and writer. She worked in top restaurants before going on to style food for films such as Titanic and for Food Network TV. Her work is featured in many magazines and books, and she is the author of Pepper (ISBN: 978-1-84975-710-2), Smoke & Spice (ISBN: 978-1-84975-350-0) and Pickled & Packed (ISBN: 978-1-84975-490-3) for Ryland Peters & Small. Read more at www.valerieaikman-smith.com.